Kayaking on Oahu is one of my favorite activities to do on the island (along with hiking to waterfalls and going to the beach). However, most people only know about hiking to the Mokulua Islands, even though there are so many options to chose from! Here is a guide to everything you need to know about kayaking on Oahu. How Do I Get a Kayak on Oahu? For the most popular kayaking destinations on Oahu like the Mokulua Islands, there are easy-to-access places where you can just pop in and rent a kayak and paddles. If you plan on going on a kayaking tour (which I write about towards the end of the post), those will be provided by the tour. If, however, you plan on tackling one of Oahu’s lesser known kayaking spots, there will be an extra step before you can get a kayak. There are actually a couple of companies that will deliver kayaks to a destination and pick them up from a destination, like Hawaii Beach Time and Active Oahu Tours. 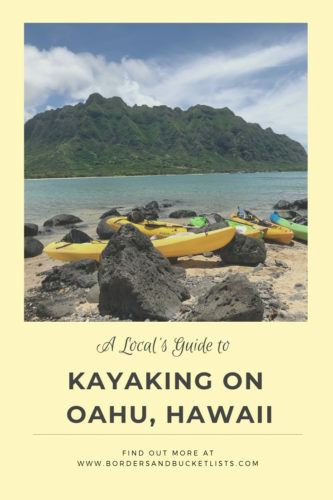 This will definitely come in handy for the majority of these Oahu kayaking recommendations. What Else Do I Need to Bring to Kayaking on Oahu? Kayaking on Oahu is an activity that you can potentially do without getting wet at all. Or you can get just a little bit wet. Or you can of course get very wet. But you don’t want the rest of your items to get wet at all, so that’s why a waterproof bag can come in handy. If you have kayaked before and know that you are in the “just a little bit wet” category, this water-resistant miniature High Sierra bag is my go-to and recommendation. I don’t know about you, but I always get hungry when I do any sort of physical activity. So whenever I go kayaking on Oahu, I remember to bring a snack in my bag. Think about bringing something from Part 1 or Part 2 of the Hawaii Food Bucket List! You don’t want to get dehydrated! And why not help out the environment by putting it in a reusable bottle? Hawaii became the first state to ban sunscreens that hurt the reefs and ocean life. While this law does not come into effect until January 1, 2021, why not start preserving the reefs and ocean life now? 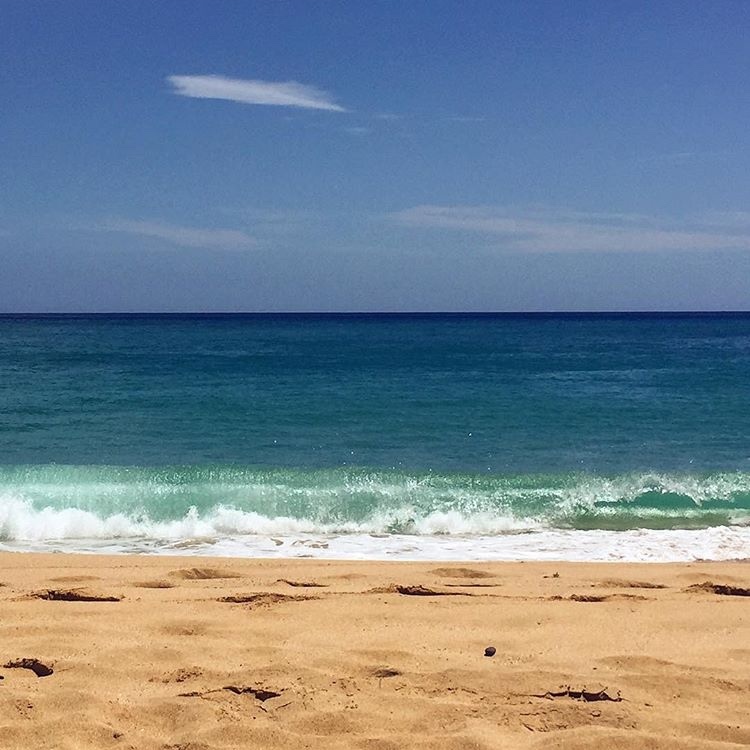 Stream2Sea, Raw Elements, and Kokua Sun Care Hawaii are three fantastic reef-safe sunscreen options. When that bright Hawaiian sun reflects onto the water, it can be a bit difficult to see at times. Remember to grab a pair of sunglasses before you head out on your adventure! Perfect for documenting your adventures. The GoPro HERO5 is a great option! However, if that’s a little too much money for your bank account to handle, the AKASO EK7000 is a pretty good alternative. Please be aware of the tide when you head out on your kayaking adventure! Depending on the location, the tide can very much affect your experience. If the tide gets too low, you might be scraping the bottom of the kayak and damaging the coral. If the tide gets too high, the waves could flip your kayak over! Before kayaking on Oahu, check the tide of your specific kayaking location on that day. I will address this concern when necessary in my recommendations below. Along similar lines, when the tide is low, you may hit the reef. Not only may the coral be sharp, but it also harmsthe coral and consequently the ocean life as well. If these warnings freak you out a bit, perhaps consider taking a guided kayaking tour! Scroll towards the end of the post to read about your options. Where Should I Go Kayaking On Oahu? Kayaking to Mokulua Islands (or “the mokes”) is easily the most famous kayaking destination on Oahu. Considering the medium-level difficulty of this kayaking expedition, it is actually quite surprising that this place to kayak is so popular. Before heading out, check to make sure that the tide will get lower as you continue your journey. If the tide is high when you try to head back, the journey will be significantly more difficult. The kayaking adventure to the Mokulua Islands starts at Kailua Beach, where it will be quite easy to rent a kayak for a couple of hours. 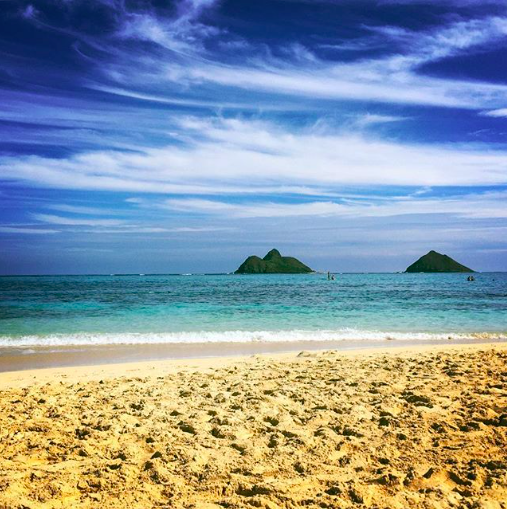 Maybe add an extra hour if you plan on exploring the Mokulua Islands on foot. From there, you’ll set your sights on Moku Nui (the closer of the two islands) rather than Moku Iki (that one’s not open to the public). On the western shore of Moku Nui (the side closest to Kailua Beach), there will be a small beach. That’s your exact destination. On the island, there is actually a bird sanctuary and a small hiking path that goes around the entire island. 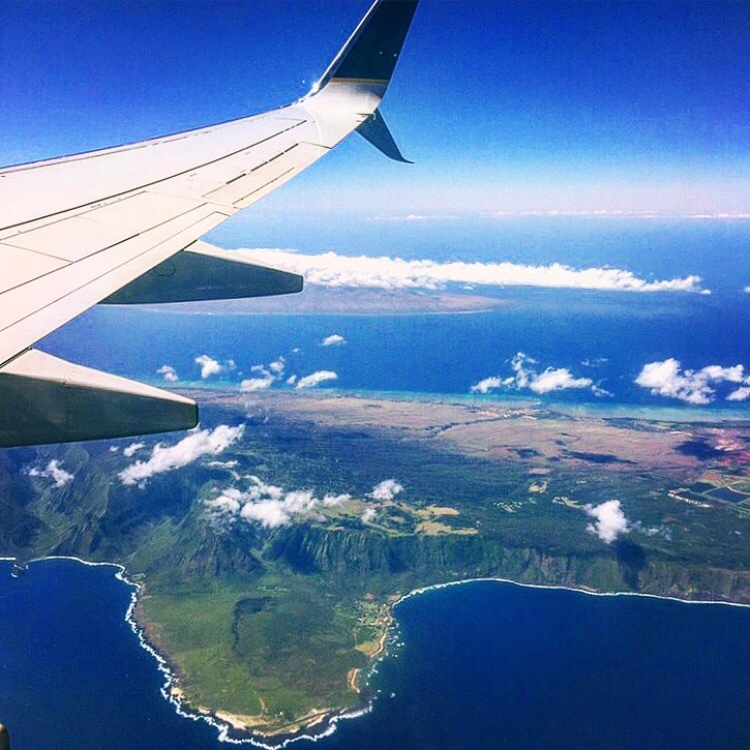 From the back side of the island, you might be able to see the neighboring island of Molokai! If you do plan on doing this hike on Moku Nui, consider bringing some hiking shoes and socks in your waterproof bag. Kaneohe Bay allows for some calmer kayaking adventures to another couple of islands: Coconut Island and Sunken Island. Most of Kaneohe Bay is protected by Oahu’s only barrier reef, which means a couple of different things for you. First of all, it means it helps to block off a lot of that open ocean current. Second of all, it means that there will be a ton of cool sea life hanging out around that barrier reef. As for the two islands mentioned previously, here is a little bit of information. Coconut Island was used for the filming of Gilligan’s Island back in the day. It is now used by the University of Hawaii for studying marine biology. You’ll know which one is Coconut Island, because it has two tall surprisingly tall trees growing in the middle. As for Sunken Island, if you want to actually have the chance to enjoy it, you’ll want to go during low tide. During low tide, this shallow island creates a sort of sandbar effect with surrounding turquoise waters. During high tide, well, the Sunken Island is hidden under the water. 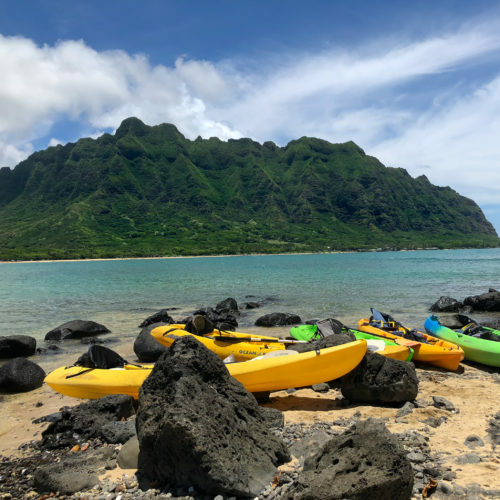 If this Kaneohe Bay adventure seems like the one you want to enjoy, you’ll have to either transport your own kayaks or have them delivered to you at a scheduled time (as explained at the start of the post), as there is no place to rent kayaks in the area. Also within Kaneohe Bay is the kayaking adventure to Chinaman’s Hat. This little island has found its way onto many of Oahu’s postcards, but most people have never bothered to do more than take a picture with it! But you can be different and kayak to Chinaman’s Hat! It’s 45 minutes of kayaking (one way) coupled with quite a difficult hike. However, the views are stunning, and I would definitely recommend. You’ll have to bring your own kayaks or have them to delivered to you in order to kayak to Chinaman’s Hat. Have them delivered either to Kualoa Beach Park or to the unnamed beach right across from the entrance of Kualoa Ranch. I’ve actually written an entire post about kayaking to Chinaman’s Hat, so check it out if you’re interested! Keehi Lagoon Beach Park is one of the most stunning sections of Oahu that no one has ever heard about. Right next to the airport, there are dozens of plant-filled round islands dotting the shallow turquoise waters. (They are so shallow during low tide that you can just walk between some of them! But, again, check the tide.) Overall though, the water at Keehi Lagoon Beach Park is relatively calm. When you get there, it’ll become so obvious that this is a local place for kayaking and canoeing. There are dozens of kayaks and canoes line the edges of the lagoon (assuming they aren’t being used in the water) – and that’s in addition to the giant building full of kayaks. That’s how you know you’re in a good spot. Keehi Lagoon Beach Park is another one of the Oahu kayaking locations that require you to bring your own kayak or have them delivered to you. *Warning: keep all of your belongings hidden in your car before you head out. Petty theft is a rather common occurrence. That means that if you take off any jewelry, stash it in your center console or glove compartment. If you choose to leave any sort of bag in the car, put it under the front seat from the back (think airplane-style). If kayaking through Oahu’s open ocean is much too frightening, test out the waters with some river kayaking instead. Kahana Bay is easily one of the calmest areas on Oahu, so it’s perfect for beginner kayaking. And it still has absolutely stunning views of the Koolau Mountain Range. Kahana River and Bay is another one of those places that you’ll either have to transport your own kayak to or have it delivered. 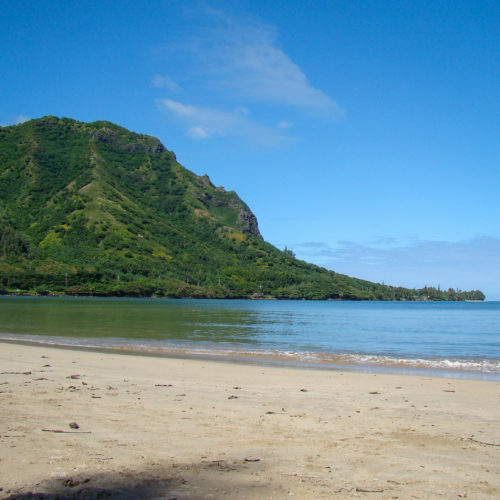 *Fun Fact: if you’re a little bit of a history buff, Kahana Bay is actually home to an ancient Hawaiian fishpond. *Warning: once again, keep all of your belongings hidden in your car before you head out. Petty theft is a rather common occurrence here – the signs around the area will make sure you know that. That means that if you take off any jewelry, stash it in your center console or glove compartment. If you choose to leave any sort of bag in the car, put it under the front seat from the back (think airplane-style). Looking for a place to kayak on the North Shore of Oahu? Anahulu River is your spot! This relatively calm river is full of turtles popping their heads up above the surface and fish swimming below you. And guess what? This North Shore kayaking location has kayak rental places right there, such as Hawaii Beach Time! So there’s no need to have kayaks delivered to you! If you have had a ton of experience kayaking in the past and want to try your hand at kayaking between Hawaiian Islands, I recommend the Molokai Challenge. Kayakers cross over the 32-mile long Kaiwi Channel (a.k.a. the Molokai Channel), starting on the island of Molokai and ending up on the South Western tip of Oahu in Hawaii Kai. If this seems like a bit too much for just you to tackle, there are also relay options. Are There Any Companies that Will Do Kayaking Tours? Feel like you would be more comfortable if you had a guide taking you on these adventures? There are plenty of options for you! Kailua Beach Adventures’ tours cover the most popular kayaking destination on Oahu: Mokulua Islands. They offer a 2-hour excursion for $139 and a 5-hour excursion for $179. *Tip: use the promo code “kailua” to save 15% on your purchase! I’m quite impressed with Costal Kayak Tours’ range of options across the island. They cover Anahulu River, Kahana Bay and River, and Chinaman’s Hat. The price of the tour depends on the length of the tour. A two-hour tour is $80/person, a three-hour tour is $120/person, and a five-hour tour is $200/person. *Bonus: if you’re really ambitious, they have a seven-hour tour for $235/person that covers a good chunk of Oahu’s North Shore by kayak. *Local Tip: If you are local (or do the tour with someone local) or if you are in the military, you can get 10% off! 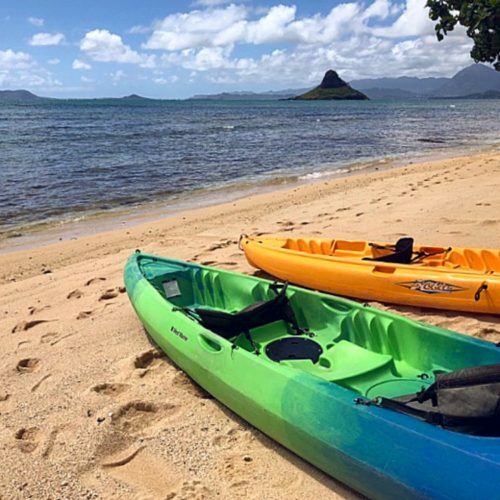 Active Oahu Tours provides a guided tour for the Chinaman’s Hat kayaking experience. This three-hour tour with both kayaking and hiking costs $120/person. Holokai Adventures offers a four-hour kayaking adventure in Kaneohe Bay for just $40/person ($20/child). This experience can also be coupled with an experience with the nearby Heeia State Park for an additional $99/person. Looking to make an environmental impact as you’re kayaking on Oahu? This tour takes you to a state park to plant native Hawaiian plants and remove those that don’t belong. 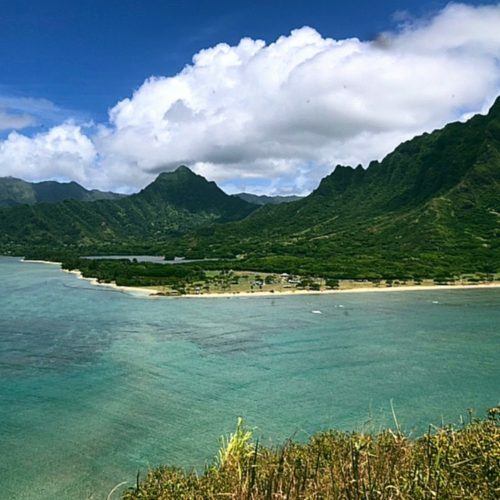 After your volunteering and lunch, you’ll get a paddling orientation from members of Holokai adventures and a few hours of kayaking in Kaneohe Bay. All of this for just $40/person! And that money goes to Travel2Change and Kamaaina Kids. So it’s just lots of good going around. On occasion, I have been asked, “Is there night kayaking on Oahu?” I’ve always thought this was such a bizarre question. I mean you see all of the natural beauty of Oahu during the day, so why would you want to kayak at night? North Shore Explorers has created an environment where night kayaking is not only possible, but encouraged. Paddle around the Lunar Legends Lagoon and discover the history of the six main islands of Polynesia as you sail on. Did you enjoy this post? Or are you hoping to go kayaking on Oahu in the future? Pin this post for later! Hawaii is definitely worth a visit! Great tips! 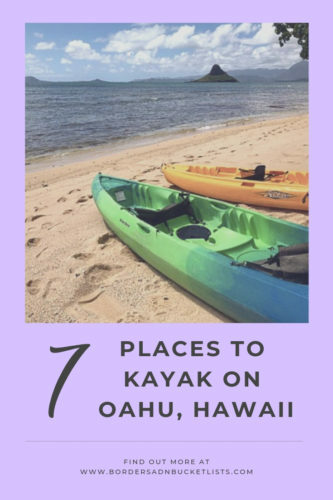 I’m off to my first visit to Hawaii in 9 days and Kayaking is one of my favourite things to do so will be checking these out for sure! Ah I’m so excited for you! 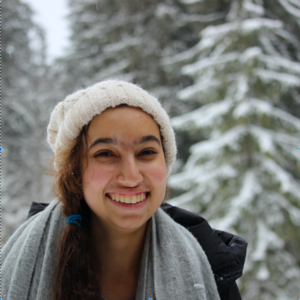 I hope all of my tips on Borders & Bucket Lists help! Kayaking in Oahu is something we would definitely love to do. It looks amazing! Hoping to go sometime soon. Make it happen! Hawaii is definitely worth a trip over! Haha I’ve got you! It’s honestly not as scary as you think, especially if you start out in a river or enclosed lagoon.